I guess you’ve already read my preview post on the Illamasqua’s products so I will start right away with the review of Blow nail polish. Blow is one of the fourth nail varnishes included in the Pastel Nail Collection for Spring 2010. The entire collection is already available in the shops or @Illamasqua website. Actually there is a special offer these days for the entire collection and you can save up to £ 13.00. 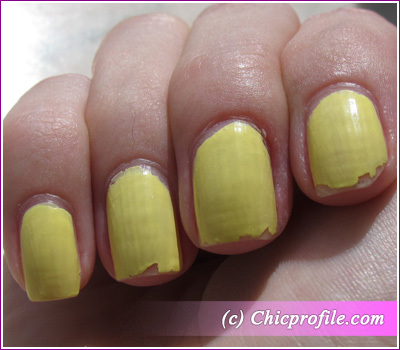 Blow nail polish is the sweetest lemon color you can wish for this season. It comes in a 15 ml bottle, the same as the other colors and if you are looking for a fun pastel color and you are into yellow shades, you might just wanna check this one out. As you probably know Illamasqua nail polishes are known for being chip resistant so as usual I’ve tested the polish for several days before I came up with the full review. Blow has a creamy light texture, easy to apply and glides smoothly over your nails. I’ve applied 2 coats to get the final result and the color is simply shiny and beautiful. Don’t worry about those lines on my nails, they are not caused by the nail polish, they are from my nails but as you can see this color accentuates them. The varnish dries out pretty fast and it’s one of the things that I like about a nail polish. Anyway I decided to apply one layer of top coat on my left hand nails and as you can see those lines were diminished and the color looks more shiny. I kept my right hand nails simple without applying any top coat so I can compare the results later on. At first let’s take a look at those nails where I’ve applied one layer of of top coat on top of the 2 layers of Blow nail polish. If this nail polish is chip resistant or not you can decide by yourself judging from the photo. The polish is indeed chipped on the ends but the color it’s still shiny and bright. These are my natural nails so this must count for something too. Now let’s take a look on the other nails where I haven’t used any top coat. Can you see the difference? I know it’s not that big but in my opinion the result is pretty similar with those nails where I’ve applied the top coat. The result is pretty amazing after 5 days and I’m really impressed with this polish. If you are not bored with wearing one color for about 4 days then you should consider Illamasqua nail varnishes. The price of one nail varnish is £ 13.oo but I think it’s definitely worth it.